The first reference I have for this line is from Sept. 1951. 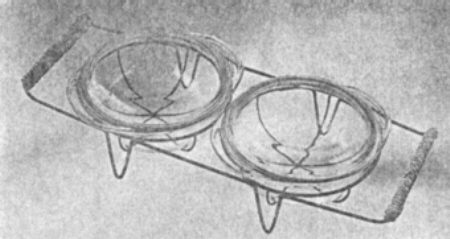 The photo caption reads, "casserole server by Ben Seibel that combines standard-size Pyrex ware with lightweight Tempron frame..."
Frames are found in black metal or brass plated. Handles are either wrapped in "sea grass" or rope. Tempron was marketed various ways, Tempron Taste Tempters was just one example.